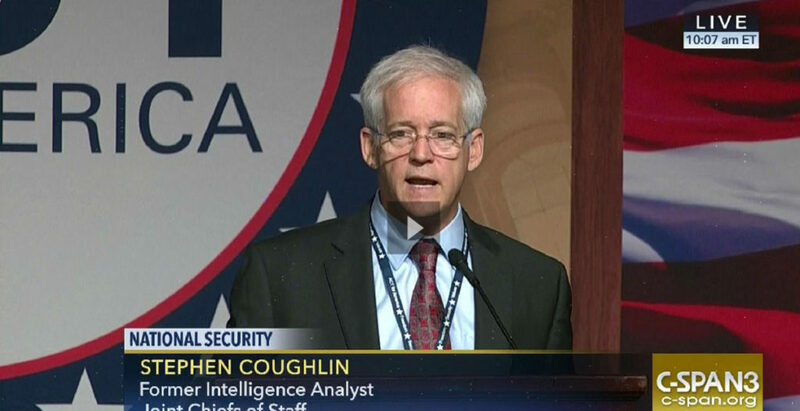 Stephen Coughlin spoke in Washington, DC at ACTCON 2016, Act for America’s “National Conference and Legislative Briefing: Taking Back America’s Security” about potential terrorist threats to the U.S. homeland. He talked about his former work and his critiques of American intelligence and homeland security agencies. Coughlin also expressed his concern about operational inadequacies at some of those agencies. WE ARE AT WAR. WE ARE AT WAR WITH AN ENEMY WHO OPENLY DECLARES HIMSELF, THEY IDENTIFY THEIR STRATEGIES, THEY WRITE THEM IN ENGLISH BECAUSE THEY HAVE CONVINCED YOU THAT IF YOU READ THEM, THEY DON’T MEAN ANYTHING, BECAUSE THERE ARE A THOUSAND DIFFERENT INTERPRETATIONS OF ISLAM. THIS IS WHAT WE HAVE TO UNDERSTAND. THEY DON’T PLAN TO WIN THE WAR ON THE BATTLEFIELDS OF IRAQ AND SYRIA. THEY PLAN TO WIN THE WAR ON THE INFORMATION BATTLE SPACE HERE. THEY EXECUTE AT THE POLITICAL WARFARE LEVEL, TARGETING CONTROL, TARGETING CONTROL AT DECISIONMAKING TO CONTROL NARRATIVES USED TO ANALYZE AND DISCUSS EVENTS. FOR EVERY POLITICIAN AND REPORTER AND PEOPLE WHO WANT TO SOUND SMART WHO STARTS OFF THEIR NARRATIVE BY SAYING THAT WHAT ISIS DOES HAS NOTHING TO DO WITH ISLAM, I HAVE A SOURCE THAT BEATS EVERY ONE OF THEIR SOURCES AND BEATS IT 50 TIMES OVER. WE ARE BEING CONTROLLED BY NARRATIVES. THE ENEMY’S MAIN EFFORT IS A SUSTAINED STRATEGIC INFORMATION CAMPAIGN AT THE POLITICAL WARFARE LEVEL. WHAT IS THE OBJECTIVE? TO WIN THE WAR BY DENYING YOU THE ABILITY TO IDENTIFY HIM, THEREBY ALLOWING HIM TO CONTROL YOU. POLITICAL CORRECTNESS IS AN ENFORCEMENT MECHANISM TO A CULTURAL MARXIST NARRATIVE THAT SEEKS TO DESTROY YOUR IDENTITY. WHEN YOU HEAR A GENERAL WITH COMBAT RESPONSIBILITIES SAY, POLITICAL CORRECTNESS GETS IN THE WAY OF MY DOING MY JOB, WHAT HE JUST TOLD YOU WAS IT WAS MORE IMPORTANT FOR HIM TO BE POLITICALLY CORRECT THAN TO KEEP YOUR SONS AND DAUGHTERS ALIVE AND TO WIN THE WAR. THE GAME IS THIS WAR IS INTENDED TO BE FOUGHT AT THE POLITICAL WARFARE LEVEL THROUGH CONTROL OF SPEECH. THE ENEMY IT IS NOT JUST THE ISLAMIC ENEMY AT THE POINT AT WHICH THEY TOUCH YOU. IT IS THESE NARRATIVES THAT WERE NOT NECESSARILY CONSTRUCTED BY THEM, BUT ARE BEING ENFORCED THROUGH WHAT ARE CALLED THE HATE SPEECH NARRATIVES. IN 2005, HE WAS INTERVIEWED IN THIS ARTICLE TO TALK ABOUT WHAT AL QAEDA’S PLAN WAS AS PUBLISHED IN 2005. AND ALL I WANT TO DO IS POINT OUT THAT THEY SAID, IN THE YEAR 2002 THAT BETWEEN 2010 AND 2013 THEY WOULD COLLAPSE THE ARAB STATES, AND THEY WOULD COLLAPSE THE ARAB STATES. THERE ARE PEOPLE WHO KNOW ME FROM BACK IN 2010 THAT I WAS BRIEFING ON CAPITOL HILL AT THE END OF 2010, WATCH OUT, THE BROTHERHOOD IS GOING TO BE LEADING THE CHARGE TO TAKE DOWN THESE ARAB STATES, IT IS GOING TO LOOK LIKE A FREEDOM MOVEMENT, AND NOBODY IS GOING TO UNDERSTAND THAT FROM BEGINNING TO END IT IS GOING TO BE A TAKEDOWN. AND THEN FIVE MONTHS LATER, IN FEBRUARY, WE SAW THE ARAB SPRING. OF COURSE THEY KNEW THE ENGLISH SPEAKING JOURNALISTS WOULD GO TO TAHRIR SQUARE AND INTERVIEW ENGLISH SPEAKING PEOPLE TO TALK ABOUT FREEDOM. THEY KNOW IT IS AS EASY AS GIVING A KID CANDY, GIVING THE WEST WHAT IT WANTS TO HEAR, SO THEY CREATED A PARTY CALLED FREEDOM AND JUSTICE. THEY KNOW WHAT YOU THINK ABOUT THAT. THEY ALSO KNOW WHAT IT MEANS IS FREEDOM FROM THE LAWS OF MAN, JUSTICE ACCORDING TO SHARIA. THE FIFTH PHASE WAS TO BEGIN IN 2013 WITH THE ESTABLISHMENT OF THE CALIPHATE, AND THE FOUNDATION OF THE ISLAMIC STATE. AND, OF COURSE, PHASE SIX WOULD BEGIN IN 2016, AND THAT WOULD BE TOTAL CONFRONTATION. I THINK THIS IS REALLY IMPORTANT BECAUSE WE HAVE A 2005 ARTICLE WRITTEN BY SOMEBODY INTERVIEWING AL QAEDA ON A DOCUMENT THEY WROTE IN 2002 TELLING YOU WHAT THEIR TIMELINE IS, AND THEY ARE EXACTLY WHERE THEY SAID THEY WOULD BE. EXACTLY WHERE THEY SAID THEY WOULD BE. WITH SAN BERNARDINO, THE MUSLIM BROTHERHOOD TOOK CONTROL OF THE NARRATIVE FROM BEGINNING TO END. . . .
OUR NATIONAL LEADERS DECIDED THAT THEY WERE GOING TO BE ASSOCIATED WITH THE MUSLIM BROTHERHOOD INCLUDING TO ALLOW THEM TO SET THE DEBATE TO ALLOW THE ATTORNEY GENERAL TO STAND ON A MUSLIM BROTHERHOOD DIAS TO THREATEN AMERICANS AND TO HAVE THE “LET’S TALK ABOUT HOW MUCH OF A TRAGEDY THIS IS”–AT A MUSLIM BROTHERHOOD MOSQUE. THE MUSLIM BROTHERHOOD REPRESENTS LEADERSHIP ELEMENT OF THE MUSLIM COMMUNITY IN AMERICA BECAUSE THEY GET THE MEDIA AND THEY TALK TO OUR GOVERNMENT, IT IS NOT AT ALL CLEAR THAT MOST MUSLIMS AGREE OR EVEN PARTICIPATE IN THAT. SO THE QUESTION BECOMES, IF YOU ARE MUSLIM, AND YOU WANT TO BE AN AMERICAN CITIZEN AND OBEY THE CONSTITUTION OF THE UNITED STATES, DO YOU THINK YOU’RE GOING TO GO TO THE FBI OR DHS TO REPORT A POSSIBLE TERRORIST EVENT WHEN YOU KNOW THEIR OUTREACH PARTNERS OF THE BROTHERHOOD? ARE YOU GOING TO DO THAT? WHO GUARANTEES, REALLY, THAT YOU’RE NOT GOING TO GET REPORTS FROM THAT COMMUNITY BESIDES THE BROTHERHOOD WHO ARE THREATENING PEOPLE RIGHT HERE? WE’RE SEEING THE BROTHERHOOD ACTUALLY ADVERTISE WHAT THEY’RE DOING, WE’RE SEEING OUR GOVERNMENT COMPLETELY AFFILIATE WITH THEM AT THE TIME OF TRAGIC EVENTS, AND IT GOES RIGHT BY PEOPLE. I WOULD ARGUE THAT OUR WHOLE ORIENTATION TO THE WAR ON TERROR HAS BEEN REDUCED TO INCOHERENCE. AND THAT WE HAVE LOST THE BATTLE AND THE INFORMATION BATTLE SPACE. WE HAVE LOST IT. THE VERY WAY WE TALK ABOUT THIS WAR ENSURES THAT WE CANNOT EFFECTIVELY ENGAGE IT. LEADERLESS JIHAD, HUMAN TERRAIN, VIOLENT EXTREMISTS, LONE WOLF. EVERY ONE OF THEM ARE NONSENSE. THEY SOUND ANALYTICAL. THEY’RE NOT. THEY ARE DESIGNED TO GET YOU TO TALK ABOUT WHAT A POLITICAL SCIENTIST, A SOCIOLOGIST OR ANTHROPOLOGIST THINKS IS INTELLECTUALLY INTRIGUING WHEN THEY BUILT A MODEL TO UNDERSTAND EVENTS THAT COULD BE EXPLAINED WITHOUT THE MODEL. IS NATIONAL SECURITY STAFF GOING TO ADMIT THEY GOT IN BED WITH PEOPLE WHO DECLARED THEIR OBJECTIVE WAS TO SUBVERT AMERICA FROM WITHIN BY AMONG OTHER THINGS WORKING WITH THEM? NO. HOW MANY PEOPLE HEARD WHEN WE HEAR OUR POLITICIANS TALK ABOUT ISIS, THE FIRST THING THEY SAY IS THIS HAS NOTHING TO DO WITH ISLAM. HOW MANY PEOPLE HEARD THAT? OKAY. WHY IS IT THAT THEY GET TO TELL YOU WHAT ISLAM IS BUT IF YOU COME UP WITH A FACT-BASED, CITED, USE OF ISLAMIC SOURCES RESPONSE, YOU’RE THE PERSON WHO IS A HATER WHO HAS TO JUSTIFY WHAT HE SAID? WE GET THE KINETIC PART OF IT, WE’RE ALSO AT WAR WITH THE NONKINETIC STRATEGIES THAT ARE EXECUTING IN PLAIN SIGHT. SPLINTER MOVEMENT: YOU CREATE A NON-VIOLENT GROUP (LIKE OIC OR THE MUSLIM BROTHERHOOD), AND THEN A SPLINTER GROUP THAT IS VIOLENT. THEN AS SOON AS THE VIOLENT GROUP HITS, THE NONVIOLENCE SPLINTER SAYS IF YOU WORK WITH US, WE CAN KEEP THEM FROM KILLING YOU. WELL, WHAT DO WE HAVE TO DO? WELL, YOU HAVE TO DO WHAT THEY SAY. OH, OKAY. AND YOU SEE WE’RE GOING TO HELP YOU. WE’RE MODERATE. WE WANT TO HELP YOU. OKAY. THIS IS CLASSICAL SPLINTER MOVEMENT OPERATION. OF COURSE, THE JIHADI ELEMENTS ARE GROUPS LIKE AL QAEDA, OR ISIS, AND THE UMA PAR EXCELLENCE IS THE OIC. WE DO NOT EVEN UNDERSTAND IN AMERICA THAT OUR NATIONAL SECURITY ESTABLISHMENT DOESN’T EVEN SPEAK IN TERMS OF STRATEGIC DESIGN. SO THEY DO NOT UNDERSTAND STRATEGIC INFORMATION OPERATIONS, AND THEY WOULDN’T RECOGNIZE POLITICAL WARFARE INFORMATION CAMPAIGNS COMING AT THEM IF THEIR LIFE DEPENDED ON IT. POLITICAL WARFARE IS ABOUT CREATING THE COUNTERSTATE WHERE THE OTHER SIDE HAS PEOPLE, TECHNICAL SKILLS, WEAPONS, PROPAGANDA, MEDIA, AND CREATE LINES OF OPERATION THAT ATTACK THE POLITICAL, VIOLENT, NONVIOLENT, ALLIES AND INTERNATIONAL SPEAR HERE. WHAT YOU HAVE TO DO IS RECOGNIZE THAT AT THE STRATEGIC LEVEL AND COUNTER IT. BUT YOU HAVE TO RECOGNIZE THAT. ONE OF THE SENIOR GENERALS AT OUR SPECIAL OPERATIONS COMMAND RECENTLY MADE THIS STATEMENT. “WE DO NOT UNDERSTAND THE MOVEMENT, AND UNTIL WE DO, WE ARE NOT GOING TO DEFEAT IT. WE HAVE NOT DEFEATED THE IDEA. WE DON’T EVEN UNDERSTAND THE IDEA.” THAT’S A GENERAL OFFICER ALLOCATING FORCE TO FIGHT A WAR. DO YOU THINK THAT ISIS KNOWS THAT OUR GENERALS DON’T KNOW WHAT THEY’RE DOING? DO YOU THINK THE PEOPLE WHO ARE THE OUTREACH PARTNERS FOR OUR LAW ENFORCEMENT KNOW THAT THEY DON’T KNOW WHAT THEY’RE DOING? LET ME ASK YOU THIS QUESTION. DO YOU THINK THE RUSSIANS KNOW THAT? DO YOU THINK THE CHINESE KNOW THAT? THE COST OF NOT UNDERSTANDING THE ENEMY IS GETTING HIGH. AND HIGHER EVERY DAY. IT WILL BE INCREASINGLY MEASURED BY NEWS STORIES THAT NARROW IN ON SENIOR LEADERS INABILITY TO ANSWER BASIC QUESTIONS ABOUT THE NATURE OF THE ENEMY. IT WILL MANIFEST ITSELF IN OFFICIAL RESPONSES TO TERRORIST ATTACKS THAT BECOME PROGRESSIVELY LESS REALITY BASED. HOW MANY PEOPLE FEEL THE CALM BEFORE THE STORM? HOW MANY PEOPLE CAME HERE JUST FEELING A TAD BIT DEMORALIZED? THE ENEMY’S GOAL IS TO MAKE YOU FEEL HOPELESS AT A TIME WHEN IF YOU REALIZED YOU WEREN’T, YOU COULD TAKE THE UPPER HAND.